In this Times-Gazette file photo from Tuesday, April 9, Fairfield’s Lauren Arnold puts the ball in play against the Peebles Lady Indians. Arnold blasted a massive two run homerun on Friday at Firestone Stadium in Akron where the Lady Lions battled Cuyahoga Heights in the Spring Showcase Tournament. The Fairfield Lady Lions have dominated southern Ohio teams in the early part of this season. This past Friday through Sunday the Lady Lions travelled to Akron to play in the Akron Racers Spring Showcase Tournament against some quality teams from Northeast Ohio. Fairfield was placed in a tournament pool with Cuyahoga Heights High School, James A. Garfield High School, and Mathews High School. Cuyahoga Heights has made three State Tournament appearances and won a State Championship in 2015. Vienna Mathews has also made multiple State Tournament appearances and finished as State Runner-up in 2012. The Fairfield Lady Lions continued their dominating ways sweeping the three games to win the Akron Racers Spring Showcase Tournament. The three game sweep runs the Fairfield Lady Lions opening season winning streak to 15 games. This is a new Fairfield softball record. The previous opening season winning streak was 12-0 held by the 2014 Fairfield Lady Lions. The 2006 Lady Lions and the 2017 Lady Lions hold the longest winning streak in season at 16 games. Friday night the Fairfield Lady Lions defeated the Cuyahoga Heights Lady Redskins 7-2 in Firestone Stadium. Fairfield the home team on the scoreboard loaded the bases in the bottom of the first inning, but failed to score. Fairfield would be the first to light up the scoreboard in the bottom of the third inning. Megan Gragg led off the inning with a base hit to the left side of the infield. Kaiti White followed with another infield single to advance Gragg to second base. Layla Hattan laid down a bunt single to load the bases. Lauren Arnold followed with a double to left centerfield to drive home Gragg and Flint running for White. Taylor Lawson drove home Hattan with a ground ball out to the right side of the infield. Cuyahoga Heights rallied to score two unearned runs in the top of the fourth inning on two uncharacteristic errors by the Lady Lion defense to make the score 3-2. The Lady Lions added two more runs in the bottom of the fifth inning. Lauren Arnold was safe on an error, Hayleigh Lowe reached on a bunt single, and Molly Thackston was hit by a pitch to load the bases. Lyndee Spargur would drive in two runs with a line drive single to centerfield. Fairfield would complete the scoring with two runs in the bottom of the sixth inning. With one out Layla Hattan single and Lauren Arnold followed with a line drive home run just inside the left field foul pole. A big home run in a big park. Kaiti White was again dominating on the mound scattering just three hits, allowing no earned runs, while striking out 12 Lady Redskin hitters. The Fairfield Lady Lions returned to Firestone Stadium on Saturday afternoon to battle the G-Men of James A. Garfield High School. This was a classic softball game by two quality softball teams. 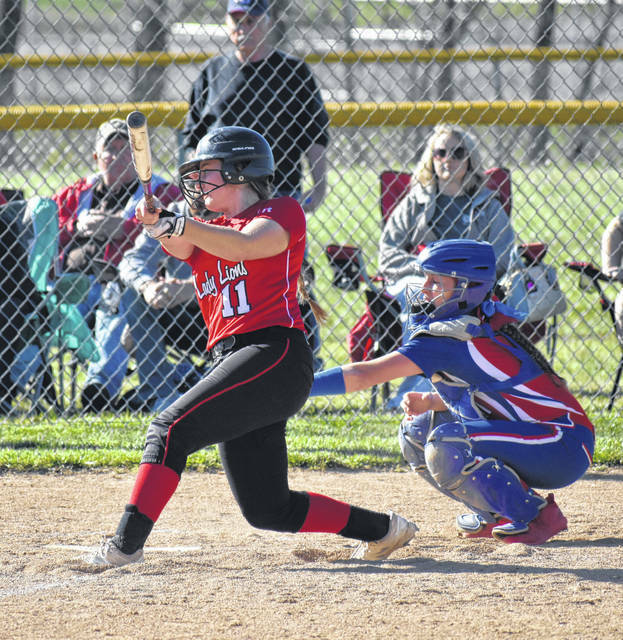 Both pitchers, Hannah Smith of Garfield and Kaiti White of Fairfield were on top of their game as both defenses played errorless softball behind them. Kaiti White was perfect through the first eleven Garfield batters she faced. She retired 18 of the first 20 batters through six innings. Hannah Smith of Garfield was equally effective through the first three innings. Fairfield would put two runners on base in the bottom of the fourth inning, but failed to score. Fairfield would score a run in the bottom of the fifth inning. With one out, Molly Thackston doubled to centerfield. Halle Hamilton followed with a bunt single moving Thackston to third base. Halle Hamilton stole second base. Lyndee Spargur pulled a ground out ball to the first basement to score Thackston. The score remained 1-0 heading into the top of the seventh inning. All Ohio player Hannah Smith of Garfield singled up the middle to lead off the inning. Catarena Sommers followed with a base hit to right field as Smith moved to third base. Sommers then stole second base. With the tying run on third base and the go ahead run on second base and no one out, Fairfield’s Kaiti White proved why she is one of the best pitchers in the State of Ohio regardless of division. White got a shallow fly ball to left field for the first out, then struck the final two batters out on just seven pitches. The Fairfield Lady Lions with two tournament wins in their pocket, looked to clinch a first place trophy with a victory over the Mathews Lady Mustangs. Kaiti White would ask for the ball again in Game 3 with only 20 minutes rest. But this game the Fairfield coaches would have her on a pitch count. Fairfield would threaten to score in the top of the first inning as Lyndee Spargur singled to lead off the game, but would left on base. Mathews lead off hitter Ashley Deans reach first on bunt single and Grace Simon sacrificed to second base. But Kaiti White retire the next two hitters to end the threat. Fairfield took an early 2-0 lead in the top of the second inning on a base hit by Taylor Lawson, a fielder’s choice by Hayleigh Lowe, a triple by Molly Thackston that scored Lowe, and a single by Halle Hamilton that scored Thackston. The Lady Lions took a 3-0 lead with run in the top of the third inning. Megan Gragg singled and scored on and an rbi single by Lauren Arnold. Fairfield add a run in the top of the fourth inning on singles by Halle Hamilton and Kaiti White, then a final run in the top of the sixth inning on a single by Gragg and a double by White. After three innings of shutout softball, Kaiti White would give way to senior Megan Gragg in the circle. White and Gragg would combine to pitch the shutout. Megan Gragg had an outstanding relief appearance facing the minimum 12 batters in four innings. Matthews pinch hitter Kailyn Ridell led off the bottom of the seventh inning with an infield single, but was quickly erased when pinch hitter Ella Vaupel hit a line drive back to Gragg in the circled who double up the runner on first base.